Background Worldwide levels of anxiety have increased significantly over the past few decades. Persistent or excessive anxiety can cause distress and decrease quality of life. 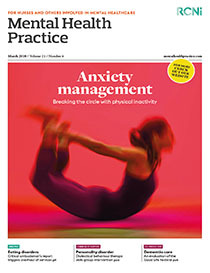 Aim To explore the relationship between trait anxiety and physical activity levels and the effect of 30 minutes of stretching exercise on state anxiety. Methods A total of 33 healthy female participants, over the age of 30, performed 30 minutes of stretching exercise. Participants completed the state-trait anxiety inventory before and after exercise as well as the rapid assessment of physical activity scale. Results Trait anxiety was negatively related to physical activity levels. There was a significant decrease in the level of state anxiety after a single episode of stretching exercise. Conclusion The results highlight the potential use of stretching exercise to alleviate anxiety and to promote physical activity in people whose lives are predominantly sedentary or who are physically inactive.